A dear friend of mine gave me an adorable Pride & Prejudice tote from Out of Print. I can’t wait to take it with me on my next library outing. 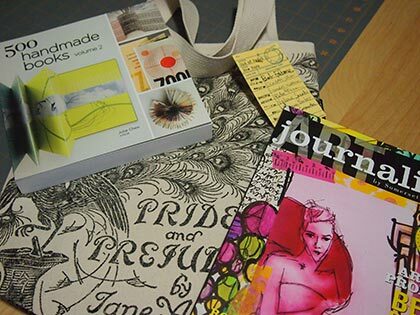 My husband totally surprised me with a subscription to Art Journaling magazine. I love that publication! And, if that wasn’t enough he also gave me 500 Handmade Books Vol. 2. I already have the first volume so this is a wonderful addition to my library. I have quite the shelf on books on bookbinding. So I’d say it was a very nice Christmas haul! I still have not put together my year end list of favorites but will be doing so very soon. I’ve actually had a bit of a hard time settling down with a book lately but finally found one that is really capturing my attention: The Absent One by Jussi Adler-Olsen. I read the first book a couple of years ago and it’s great to revisit with Copenhagen Detective Carl Mørck. I also wanted to put together some mini reviews but I get the feeling those are going to be postponed for a while longer. Anyway, more bookish talk soon! That is a great haul for Christmas! I was contemplating reading the Adler-Olsen books…I think I have the first on my Kindle and one of them on audio. I’ll put it on my 2014 to-do list. I am loving that tote! Sounds like you had a wonderful Christmas. Love the tote bag! It looks like you had a great Christmas. I really want to get some stuff from Out of Print, but I just haven’t got around to shopping there yet. Sandy – I think you might like the Adler-Olsen books. Lots of good action. Isn’t the tote great? Kailana – You should check out Out Of Print. Such cute things! I want more. Nice presents! I love the art journaling magazine! I think I want to start making my own journals in 2014. Are there any books you would recommend? Vasilly – oh you totally should give it a go! There are tons of books on bookbinding but if you’ve never tried it then I would recommend Cover to Cover by Shereen LaPlantz. Great book with some very good instructions. I would start off with any project with an exposed spine. You’ll have to post on your adventures! Wonderful holiday loot. Your husband knows you well and makes good gift choices! 🙂 I actually got two books–well, one is more of a journal but it was a themed journal–both on the First Ladies–both look really interesting. 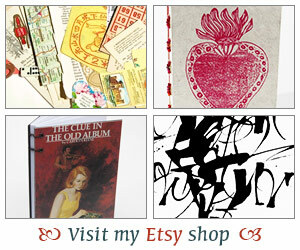 I must check out Out of Print–I love book totes! And I really want to read Jussi Adler-Olsen–I have the first book and have heard many good things about her. I have several books I want to read now and have a hard time deciding which to sit down with–a good problem indeed! Danielle – Poor guy I know he must be scouring my bookshelves when I’m not around to make sure to get me something I don’t already own! haha… I think you’d really enjoy the Adler-Olsen series. And, yes, Out of Print has such cute things. I want more stuff from them!